Darvilles of Windsor offers a classic selection of traditional blends, fruit and herb infusions and green teas. Our fine Traditional Tea blends include English Breakfast, Earl Grey, Royalty Assam and Darjeeling. Our range of Traditional Teas are available in loose leaf as part of our stunning collectable caddy range. An infusion of refreshing, energising and soothing flavours combine for our Fruit and Herb tea range. 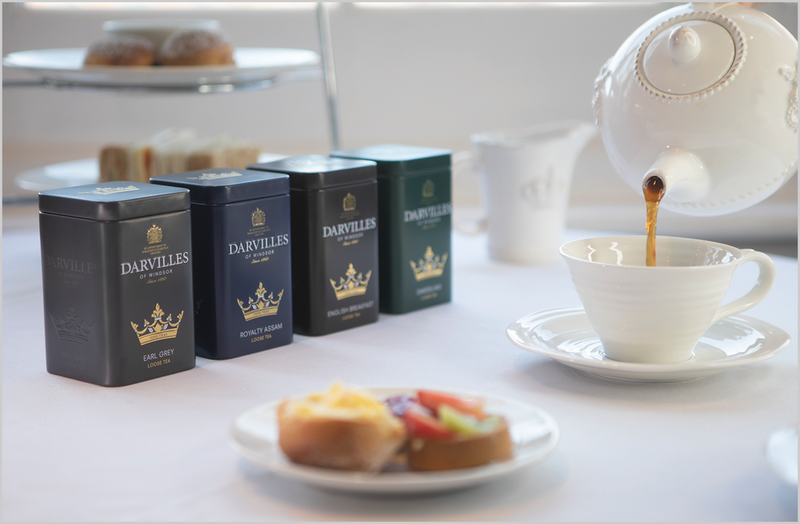 Darvilles of Windsor has specialised in the grocery trade and tea blending since 1860. The company is now run by the fourth and fifth generation of the Darville family, Peter Darville and his daughter Karen, and is the oldest family business in Windsor. Our tea range is renowned for fine taste and quality, together with a historic Royal Windsor connection. We are proud to have held the our Royal Warrant for 70 years, first granted to us by King George VI in 1946, and we continue to supply teas and various goods to the Royal Household in Windsor Castle. Our tea range is available at various retail outlets, including the exclusive Royal Windsor Farm Shop and online at the British Corner Shop. If you are interested in stocking Darvilles Of Windsor tea please get in touch.